Valeo Friction Materials India is the market leader in supplying organic facings across India and overseas. Therefore, the same range of facings can be readily supplied in aftermarket grades without incurring any additional lead time for tooling. Furthermore, we are in the process of developing moulded facings, which are expected compete head-to-head with the low-cost variants available in the market. We already are suppliers to >12 aftermarket and OES clutch manufacturers, dealers and refurbishers. 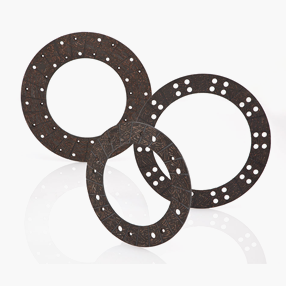 Valeo Friction Materials India Private Limited manufactures non-asbestos clutch facings for the entire range of automobiles, including three-wheelers, light and heavy trucks, passenger vehicles and tractors. We also manufacture high-performance judder-free grades for premium passenger vehicles and high-temperature resistant grades for severe applications in the truck and tractor segments. We manufacture a complete range of green facings as well, for passenger cars and trucks (OEM and aftermarket). As a responsible initiative, we use a range of materials free from asbestos, lead, organic solvents and ceramic and aramid fibre.